Written by: Joseph Hoffman. Directed by: Charles Barton. 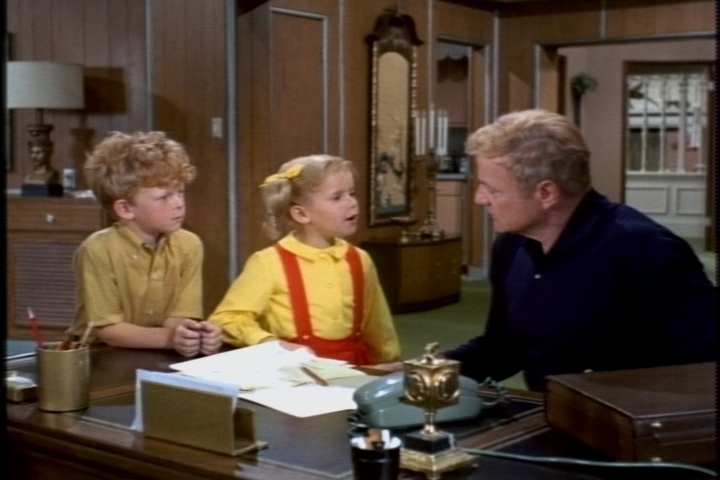 We start this episode with a familiar set-up: The kids rushing in from the park and overwhelming a busy Uncle Bill. 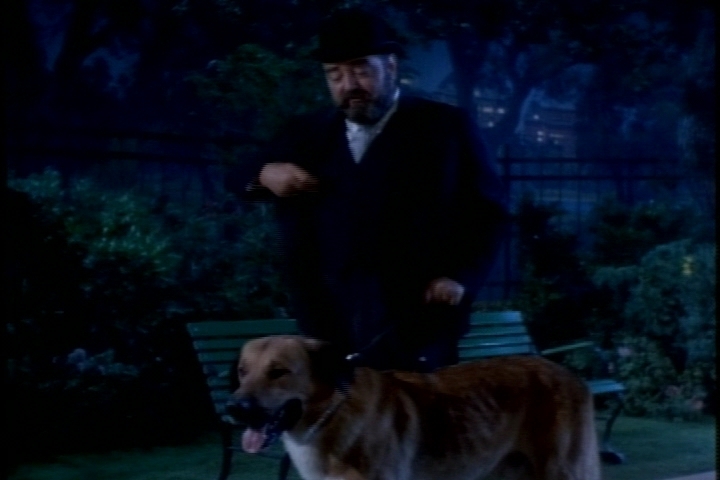 This time, they’re babbling about a new friend they made in the park–Oliver. No, not that Oliver. But the results will be similarly unlucky. Oliver’s family is going away for the weekend, and the kids want to know if he can stay over. The last time his family went away, they note, Oliver got a broken heart. Buffy, in a total non-sequitur, replies that Oliver is not exactly little. A distracted Bill doesn’t pick up on this odd comment and gives his permission for Oliver to stay. Hmmm. They are craftier–and smarter–than they look. Meanwhile, Bill gives French a heads-up that Oliver will be arriving soon. 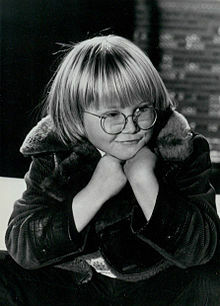 When French fails to remember a child named Oliver, Bill says the kid probably goes by a nickname, like Skinny or Curly. Soon, however, they get to meet the mysterious Oliver. “This great beast is Oliver?” French cries. The twins move back into manipulative mode. “We don’t mind if you don’t keep your word,” Jody sighs. “I guess that only goes for kids,” Buffy agrees. Does this predicament leave Bill rubbing his head? He gives in and says he’ll convince the apartment manager to let Oliver stay for a few days. Cissy, who has just come in, shows her usual knack for stating the obvious. 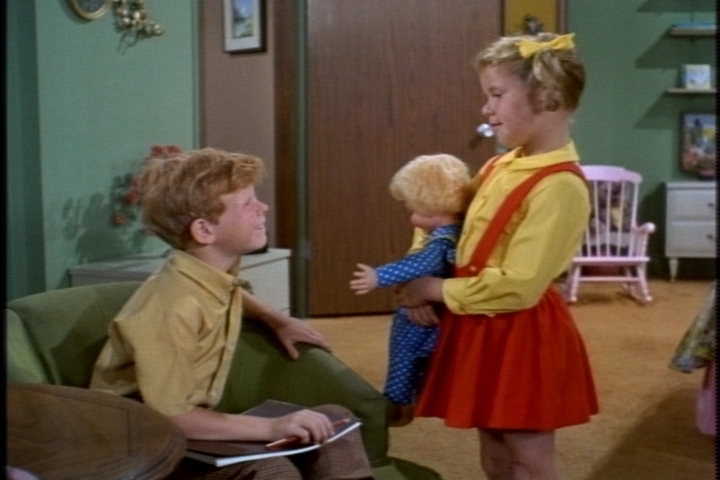 That evening, the twins fret about whether Bill would still like them if he knew they tricked him. I don’t usually like big dogs, but Oliver looks cute here. 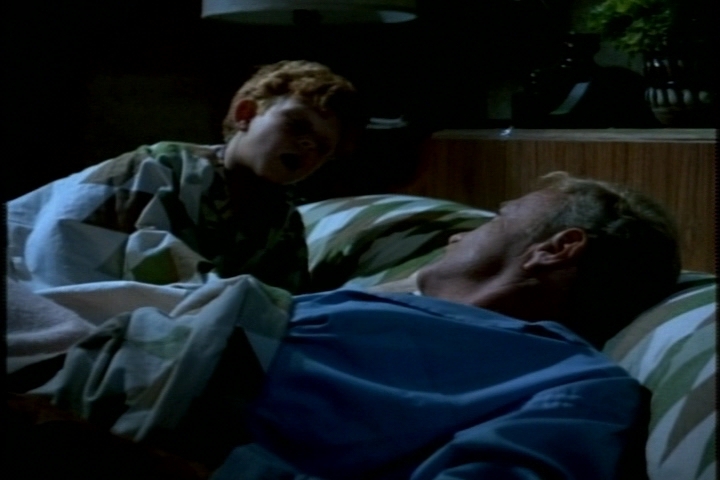 When Bill comes in to say goodnight, it becomes obvious that Oliver hates the sound of his voice. 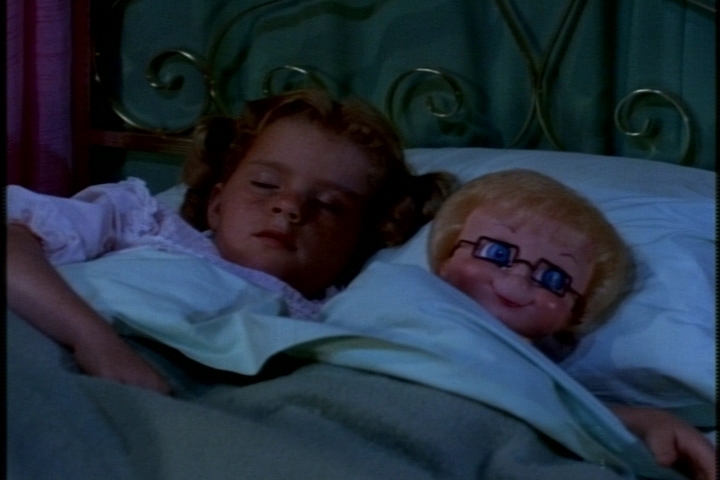 He hustles Jody off to bed, leaving Oliver with Buffy. 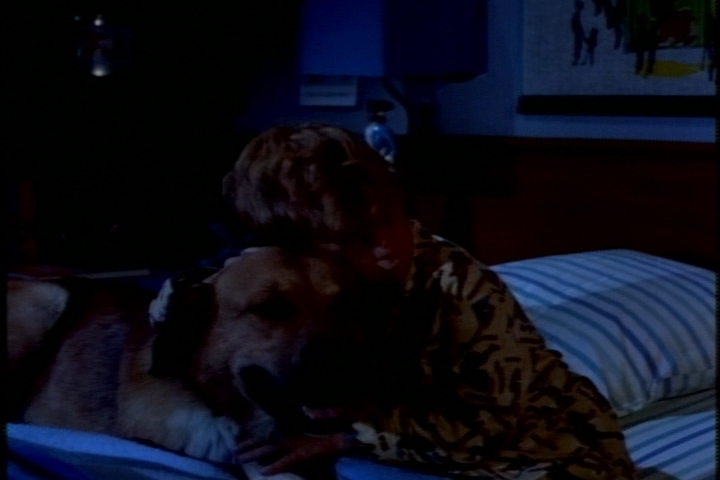 She tries to reason with the dog in an attempt to improve his relationship with Bill. 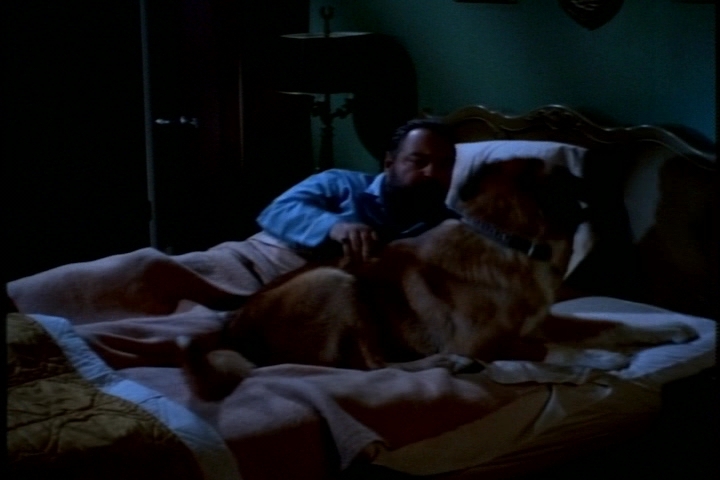 French was supposed to retrieve Oliver from Buffy’s room and confine him somewhere for the night. 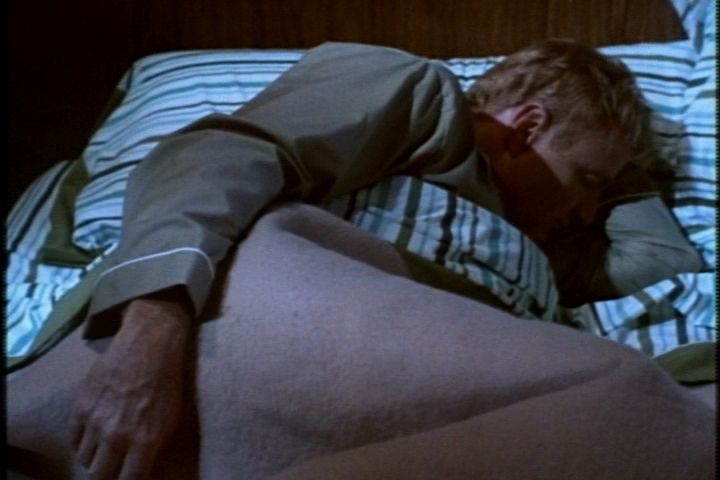 Whatever he tries doesn’t work, as Oliver later barges into Jody’s bed. Jody hushes Oliver and tells him not to wake up Bill, who has a big meeting the next morning. 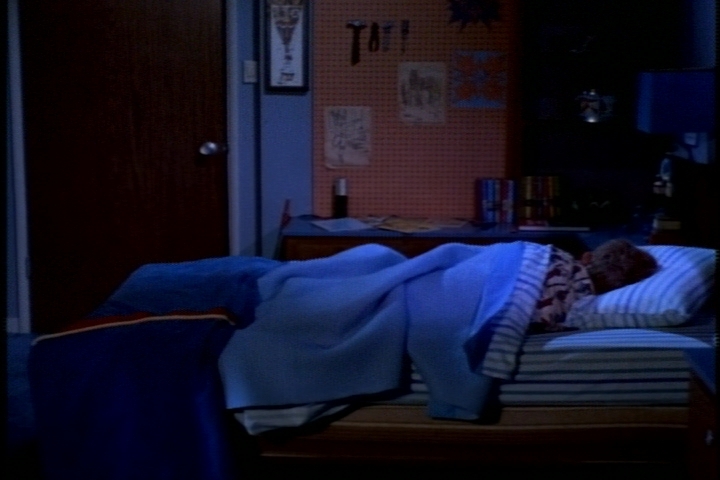 The, inexplicably, Jody barges into Bill’s room and wakes him up himself. A lonely Oliver then tries his luck in French’s room. Oliver, of course, winds up in Bill’s room. Does Bill get a good night’s sleep? He doesn’t exactly get a warm welcome from Oliver. Bill and French discuss the situation and brainstorm ideas for getting through another night. French’s first idea is having the dog stuffed, but he admits that might not be practical. Bill rejects that idea, too. Finally, French volunteers to run the dog around the park to tire him out. “He will sleep the sleep of the well-worn beast,” French promises. After an hour and thirty-one minutes–and, I suspect, little actual running–French thinks Oliver should be sufficiently exhausted. Oliver has other ideas, though–he spies another dog and takes off chasing it. 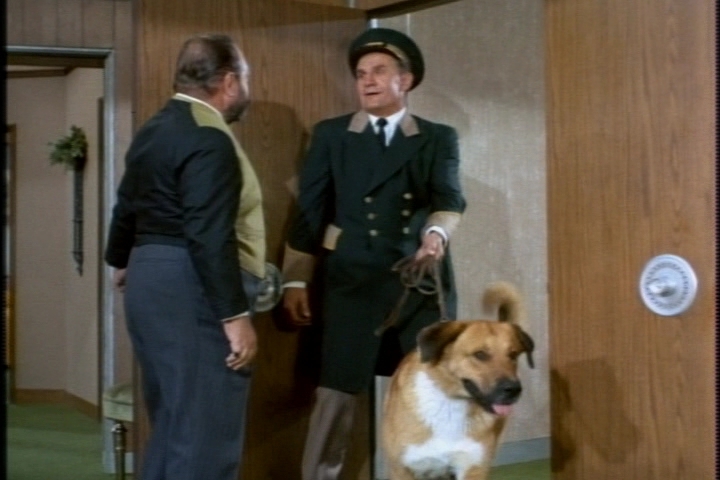 French feels guilty about letting Oliver get away, although Bill assures him that nothing human could hold the dog back. 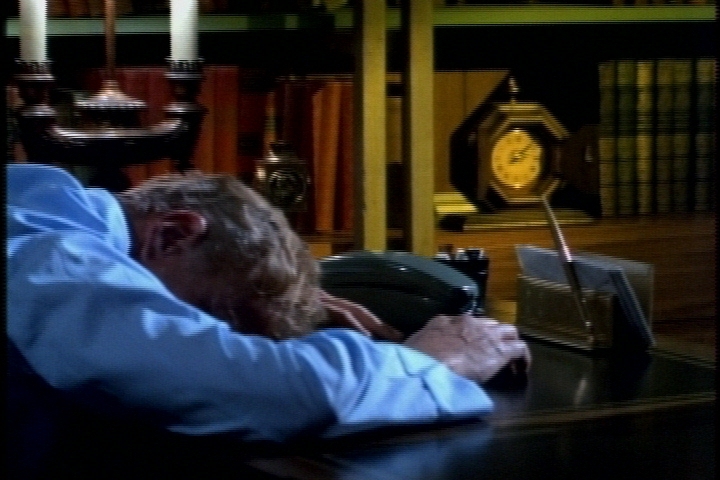 Bill reports the disappearance to the proper authorities and waits by the phone for news. Eventually, gets a call from an irate dress shop owner. It seems that when the porter left the door open for a moment, Oliver chased a cat into the shop. French and Bill have to head out before dawn to retrieve the dog.. The whole thing takes a predictable toll on Bill. He tries to explain what’s been going on at home to his co-workers. At home, Buffy and Jody are running Oliver around the apartment in another attempt at tiring him. It’s too late, though. Complaints from the downstairs neighbors bring the apartment manager to door. Comparing the Oliver’s noise to that of a horse, he orders the family to evict the dog. 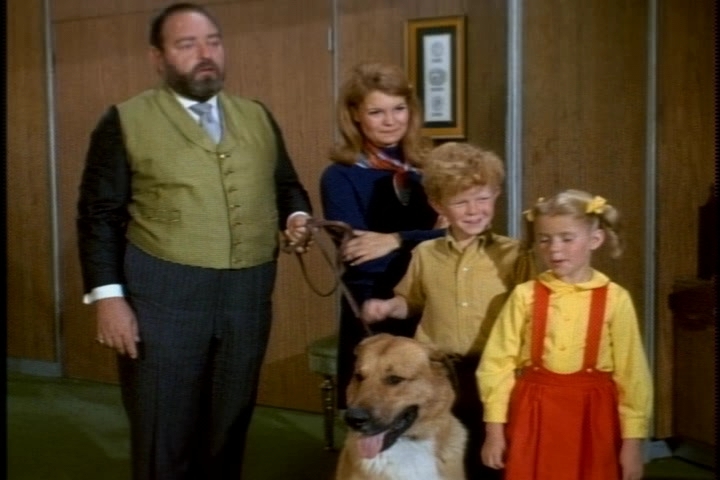 Bill tells the kids Oliver will have to spend the last night before his family returns in a kennel. Of course, he nearly caves again when the twins tug at his heartstrings. It’s up to French to make the ultimate sacrifice. “The clumsy beast seems to like me,” French sighs. …while French sits up with Oliver in a noisy, crowded kennel. Awww. Once Oliver is home safely with his owners, the twins come clean about deceiving Uncle BIll. A stoic Bill agrees to their plan. Nervously, they ask him if he still likes them. Ha! They didn’t see that coming. 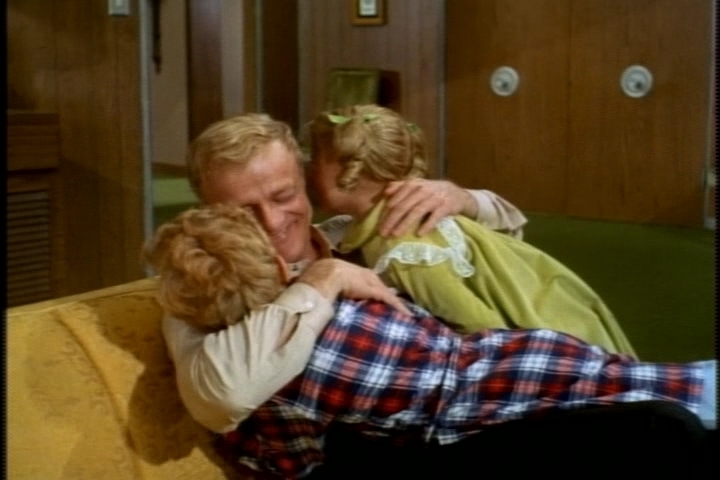 Of course, Bill soon breaks into a laugh, giving this episode a typical hugs-and-kisses ending. I’m glad they avoided the too obvious “I don’t like you…I love you” schtick. 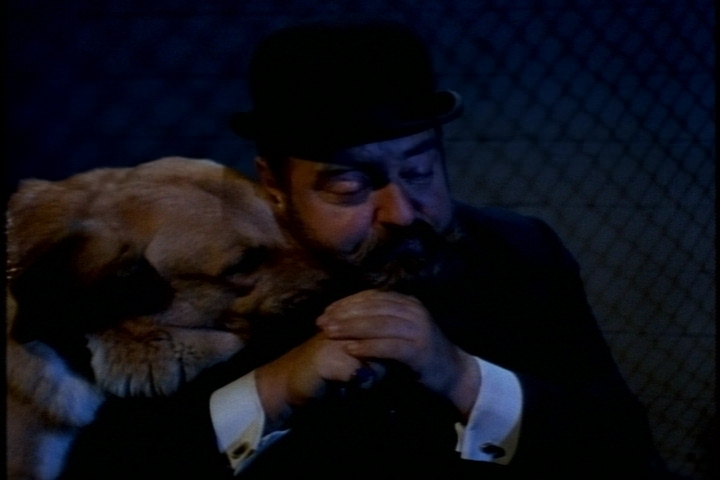 This isn’t a great episode, but it’s an entertaining one, thanks mainly to Sebastian Cabot. 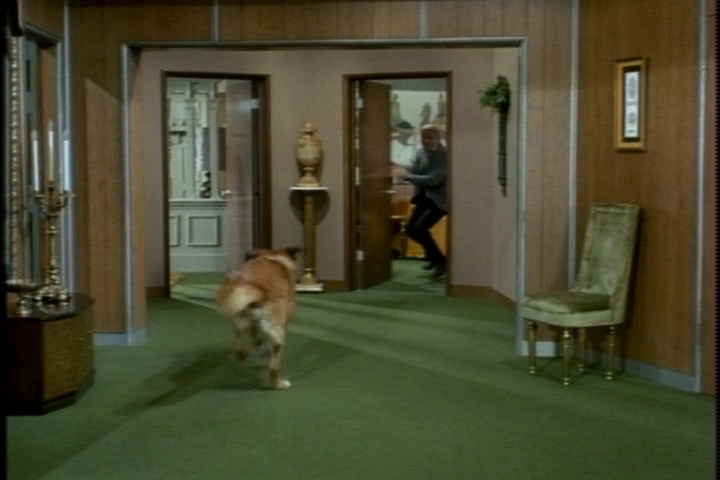 It’s also fun to watch Bill run and cower in Oliver’s presence. 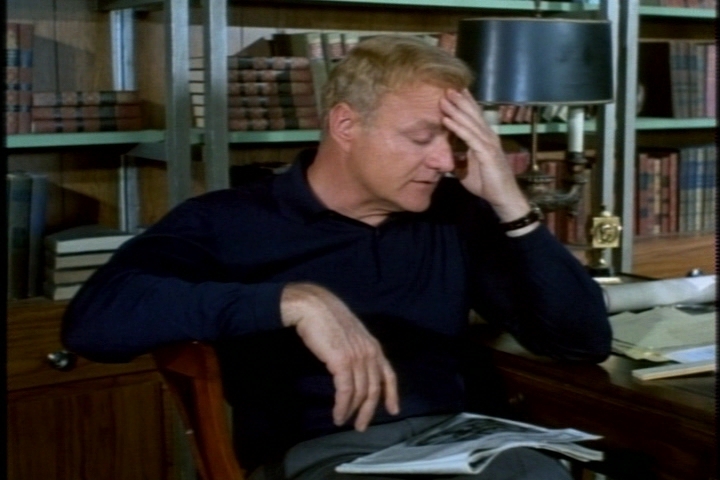 It makes a nice comic contrast with Brian Keith’s usual hyper-masculine persona. Madame Antoinette: Danielle Aubry. Policeman: David Brandon. Mr. Ross: Richard Bull. 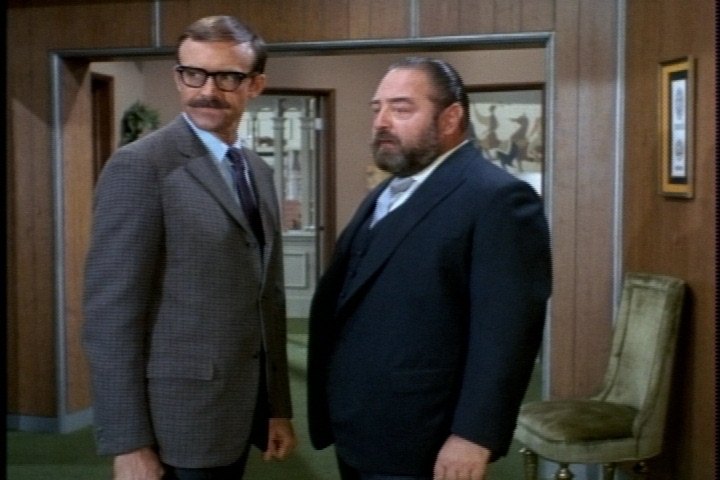 Mr. Brown: Hap Holmwood. Mr. Rogers: Vince Howard. Scotty: Karl Lukas. 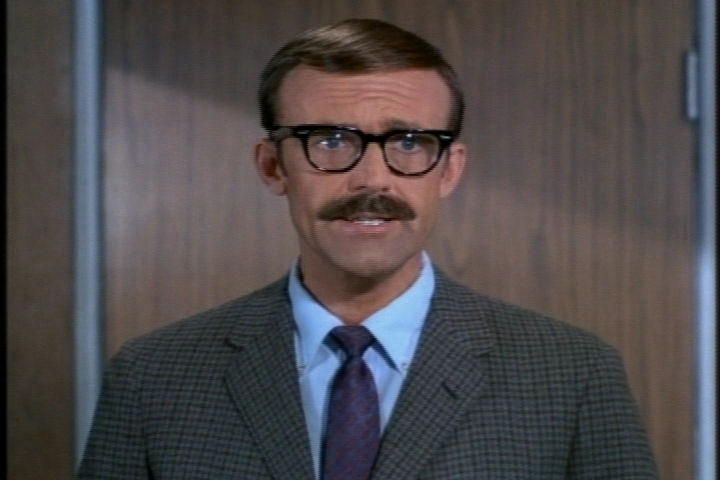 Richard Bull, who makes his second of three appearances as the apartment manager, died in February at age 89. With these glasses and this mustache, he doesn’t look much like his most famous character, Nels Oleson from Little House on the Prairie. 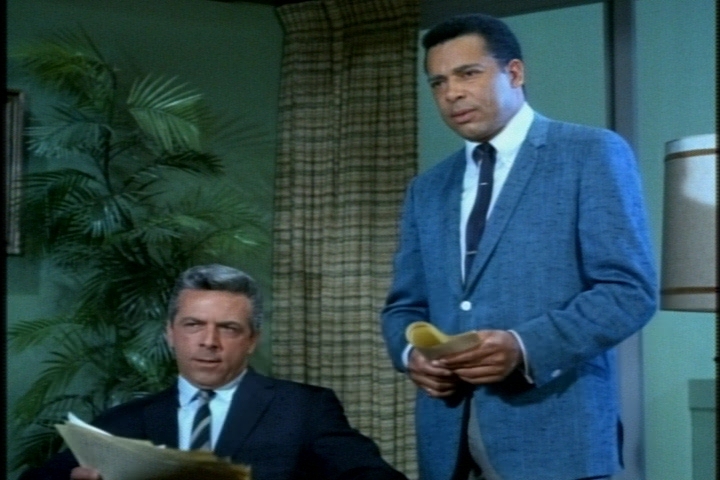 Vince Howard had a prolific career in television. It’s surprising that he doesn’t play the police officer here because that was by far his most typical role. 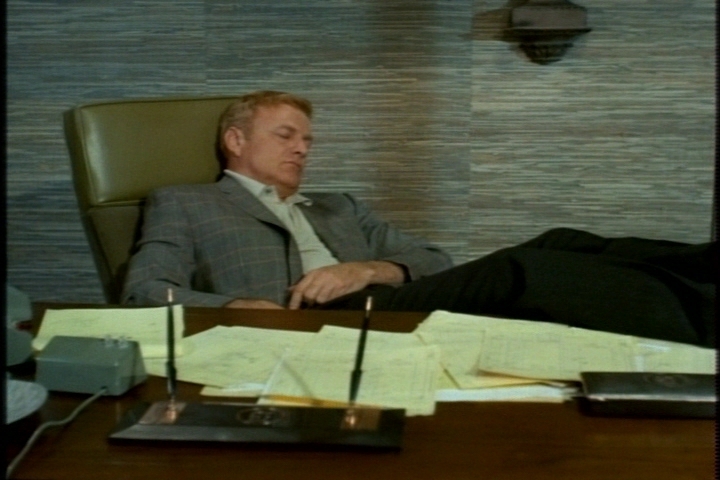 For instance, he played Police Officer Vince on Emergency! Well, apparently I’m in the dark yet again: Who is that other Oliver, the one not invited by the twins? Oh dear, my personal nightmare: dogs! 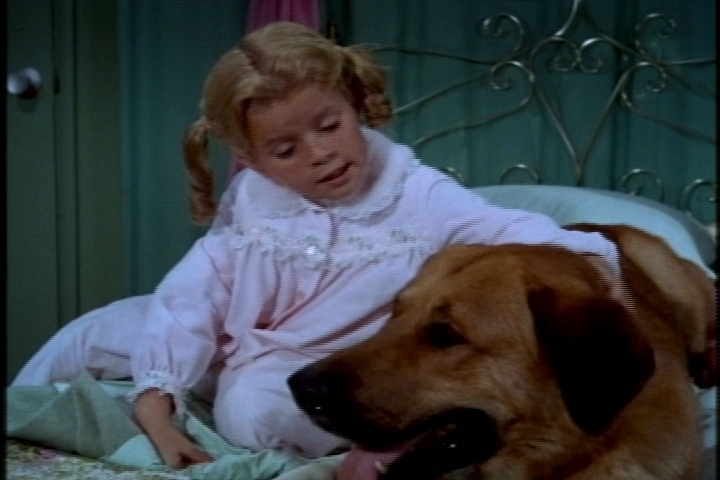 I’d have reacted more than hysterical to that huge dog, and even to a very small one, come to that. 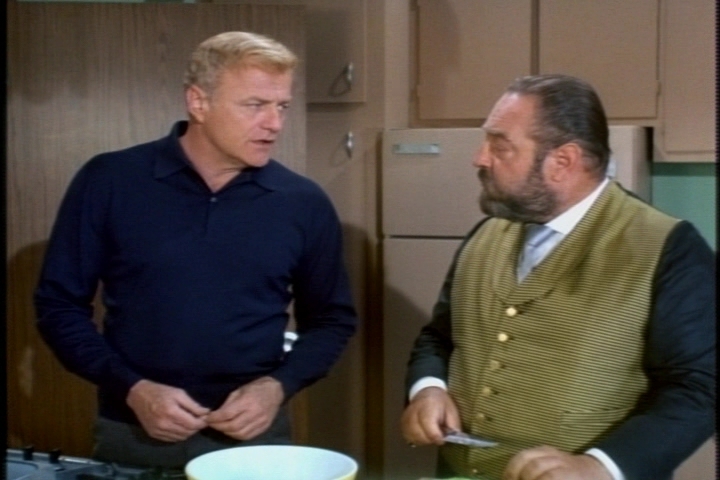 So yes, it’s real fun – even somewhat comforting to me – to watch the very manly Brian Keith run and shy away from that “elephant-sized beast”. Only with Bill it is an exceptional reaction to a dog that doesn’t like him, while with me this is my standard reaction to all dogs! Smart how Bill teaches the twins a lesson with his quick “No” response and just as quickly puts them out of their resulting misery with his laugh and hugging. 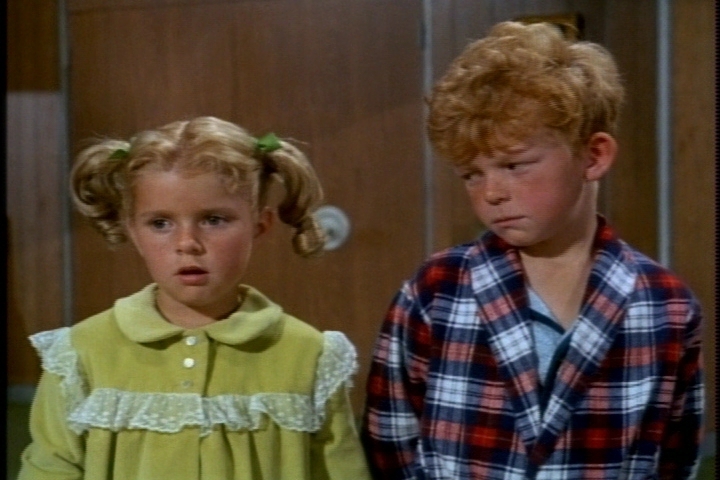 The other Oliver is “cousin Oliver,” who appeared in the last 6 or so episodes of The Brady Bunch. He was originally presented as a “jinxed” character, who brought bad luck everywhere he went. 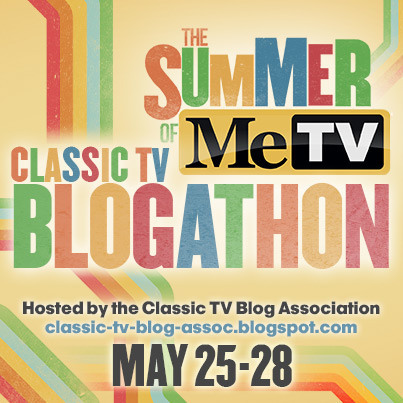 Brady Bunch fans don’t typically hold his character in high esteem. 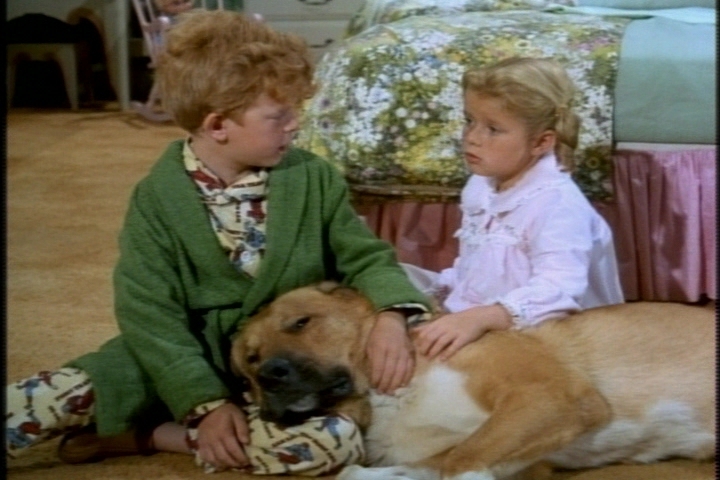 I wonder how Johnny and Anissa liked working with such a big dog. Oliver definitely would have scared me when I was their age. (I’m still not crazy about big dogs, especially when they jump on me. I like smaller dogs but have no desire to own one.) I’m sure “Oliver” was well behaved, though, and that his trainer was just out of camera range. Hmm, you’re from Germany and dislike dogs–you’re not Angela Merkel, are you? Just kidding, but I have read that she shares your distaste. I’m not sure an American could be elected president if he or she admitted to disliking or fearing dogs! 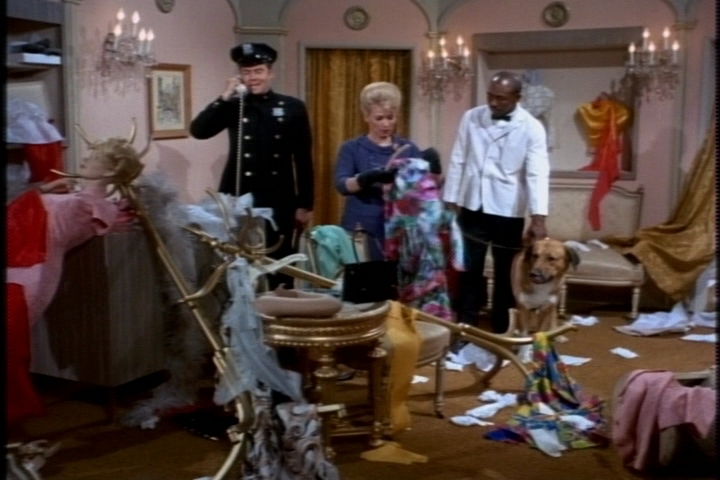 I like all the things Oliver gets compared to in this episode–an elephant, a horse, a monster, etc. Bill was clever at the end, but I think the twins got off fairly easy. It was mean to trick Bill and take advantage of his sense of honor. I learned about Angela Merkel’s dog phobia only recently, when Putin viciously took his big Labrador to a meeting with her and frightened her quite a bit! Had I known about her fear before last year’s election in Germany, I’d probably have voted for her (kidding, too). At least, she has a reason for her fear and distaste of dogs because she was severely bitten when she was young. I, however, have no reason at all, unless it is a subconscious one! I’m glad I’m not an actress having to work with dogs, I’m glad I’m not a Chancellor having to deal with Presidents and their nasty dogs, and I sure hope I will never land in a nursing home for the elderly where therapy dogs are used! That truly was an uncharacteristically mean act of the kids – and they were well aware right away that it wasn’t the right thing to do! 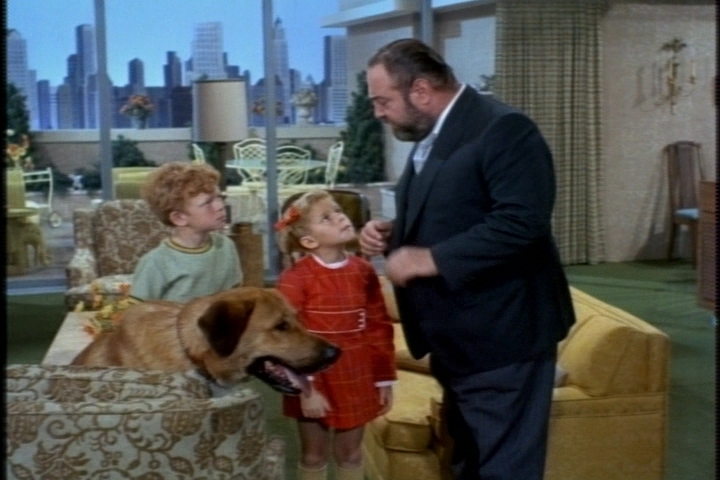 Yes…it would be especially hard to deal with a dog that size in an urban apartment like the Davis family’s.